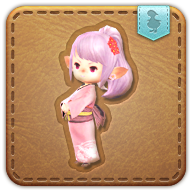 Summon your dress-up Tataru minion. To thank those adventurers who have come to her aid while in Kugane, Tataru Taru of the Scions of the Seventh Dawn has been presenting her knights in shining armor with handcrafted replicas of...herself, fully clad in the finest silks from Bukyo. Reduces minion summoning recast time by 50%.